Let’s talk Texas snakes. Using the NatureServe Explorer 2016 database as a comparative reference, the United States hosts 163 snake species. Texas hosts 78 of those species, or close to 50% of all US species. Arizona and New Mexico come in second and third on the snake diversity list with 57 and 55 species respectively. No doubt Texas sits atop the snake diversity category for the United States. Taking those facts into consideration, Texas snake diversity is at least a standard deviation above even the Arizona mark and two standard deviations above the national average. What explains snake diversity in Texas? The Texas snakes story is primarily a story of the large Texas territory and regionalism. Snake species spillover from the Southeast, Southwest, Midwest and tropical Mexico all contribute to Texas snake diversity. For example, a look at a Texas snake atlas shows that only two species, the Common Kingsnake (Lampropeltis getula) and the Coachwhip (Masticophis flagellum) have a state wide range. All other species ranges are mapped as either north, south, east or west Texas, or a combination of a few of the geographic areas. While species spillover tells most of the story, Texas is also home to about a dozen snake species not found anywhere else in the United States. The top picture, for example, shows a Schott’s Whipsnake (Masticophis schotti schotti). 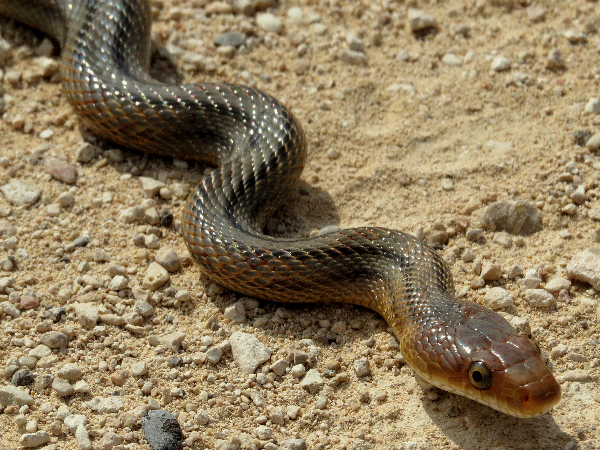 Texas also hosts three of the most common racer, whipsnake and coachwhip species documented in the United States. This one example how combining the unique with the new amplifies Texas snake diversity. A similar Ratsnake story can also be told. Texas hosts about five species or subspecies of common Ratsnakes. In fact, the Texas Ratsnake, a subspecies of the common Eastern Ratsnake (Pantherophis obsoletus) ranks as the dominant ratsnake species in all of East Texas, north to south. The phrase look for it in north Texas and the Dallas – Ft. Worth area needs a bit of explanation. They are habitat adaptable and can grow seven feet in length. Given the size, most suburbanites will not have difficulty seeing a seven foot snake climbing the tree in the back yard. Fortunately, they are non-venomous. A lack of rodents in the neighborhood means they are often just passing through looking for their next meal. On the other hand, Texas is also home to the Baird’s Ratsnake (Pantherophis bairdi), in the picture. It is a unique Texas snake with a range limited to the Rio Grande River border area, again adding to Texas snake diversity. High snake diversity coupled with urban sprawl and development translates into many snake species being habitat adaptable. Therefore populations in all of Texas urban areas cross paths with their local snakes. Looking again at the Dallas – Ft. Worth area, according to researchers from the University of Texas at Arlington, the metropolitan area and surrounding suburbs host around thirty different snake species. Look south and/or east and discover that at lest sixteen snake species have a very limited range along the Texas Gulf Coast and/or the tip of South Texas. Everywhere you look in Texas, there’s a bunch of snakes, including about one dozen venomous snakes from all four venomous snake categories, coral snakes, copperheads, cotton mouths and rattlesnakes. Rather than presenting a book style presentation of all the Texas snakes, this brief overview presents the Texas Gartersnakes. The green snakes button leads to snake pictures and information covering many of the Texas snakes that spillover from the Southeast, Southwest and Midwest regions of the United States. 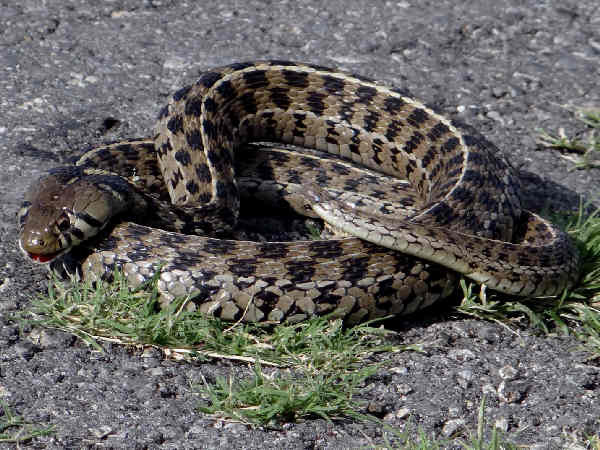 Almost nothing says snakes to the average Texan as the Texas Gartersnakes. 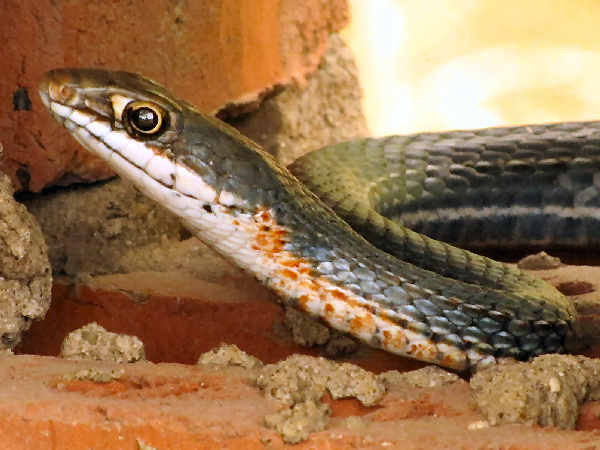 The five gartersnake species are ubiquitous in residential areas as well as fields and forests all over the state. They can grow to three or four feet in length and generally display benign behavior. Because they have adapted to life among humans, they don’t automatically scurry away when approached. That makes them great photography subjects. Unsurprisingly, Texas Gartersnakes show the same geographical divide as typical of all Texas snakes. 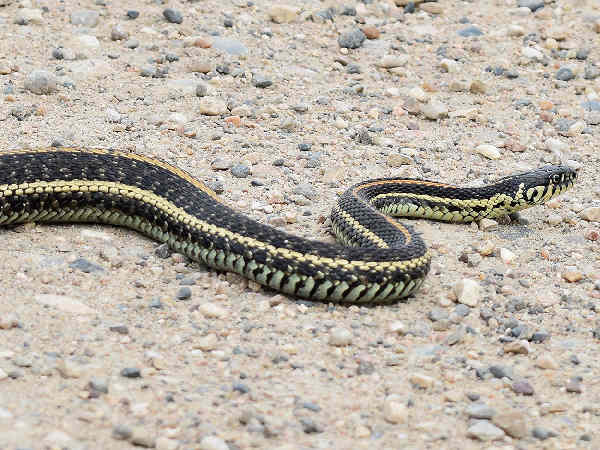 In the eastern part of the state, the Common Garter Snake (Thamnophis sirtalis) prevails. A few different subspecies have been identified. 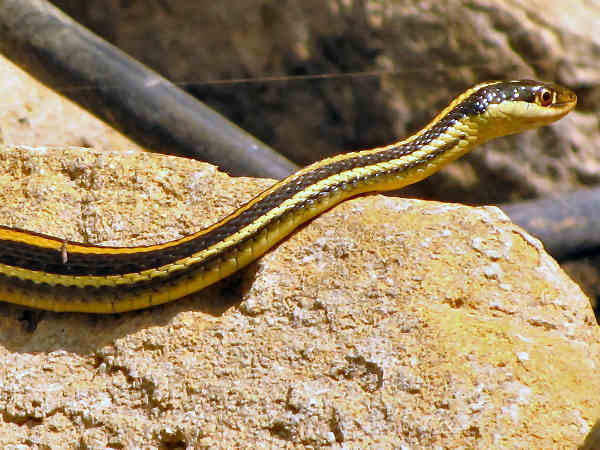 Of special interest is the subspecies with the name Texas Gartersnake (pictured above). The red line down the center of the body is the field identification clue. The black-necked gartersnake (Thamnophis cyrtopsis) is typically described as a Southwest species. Their range extends from West Texas into the to California along the border. Some neighboring states such as Oklahoma and Utah. Subspecies have slight color differences. The presence of the black color on the neck unites them. Checkered Garter snakes can truly be called a Texas species. There are smaller populations in California, Arizona and New Mexico. However, this species dominates all of Texas except for the east where it gives way to the common garter. 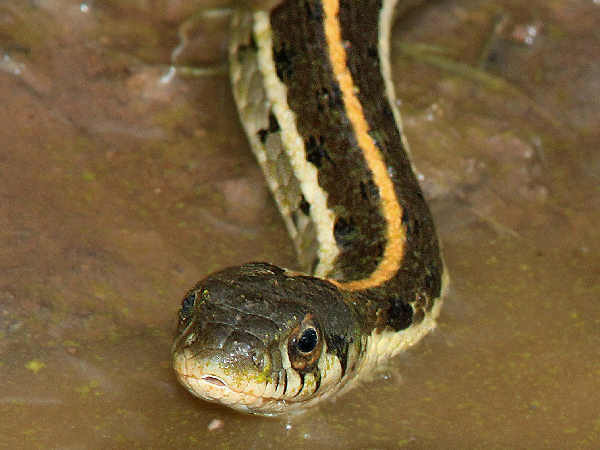 Like all garter snakes, they have stripes down the body. Unlike most garter snakes they have a very pronounced checkered pattern complimenting the stripes. It’s hard to misidentify them. Plains Gartersnake (Thamnophis radix) are primarily a Midwest species that spills over into the northern most Panhandle counties. They share space with the Checkered Gartersnakes, so their light color stripes against the dark body are sufficient field clues for identification purposes. Ribbon snakes refers to a group of snakes in the genus Thamnophis, differentiated by the presence of longer tails and a light patch in front of the eye. Up to five subspecies of Western Ribbon Snakes (Thamnophis proximus) range across th state. 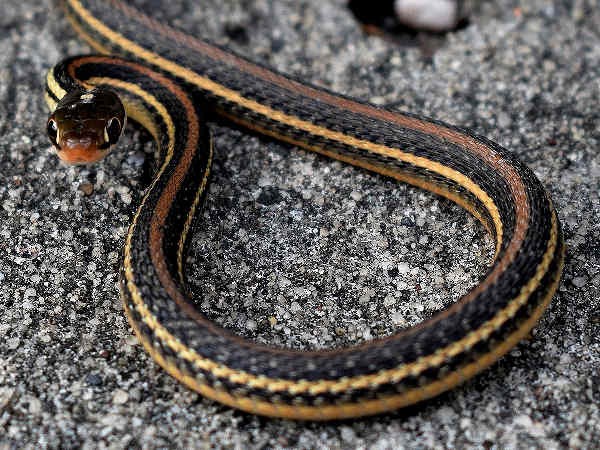 The picture shows a Gulf Coast Ribbon Snake (Thamnophis proximus orarius). As the name suggests, it lives along the Gulf Coast waterways from Houston in the north to Brownsvile in the south.